The Columbia Plateau, Snake River Plain, and Hawaii are large volcanic areas in the western United States and mid-Pacific ocean that contain extensive regional aquifers of a hard, gray, volcanic rock called basalt. 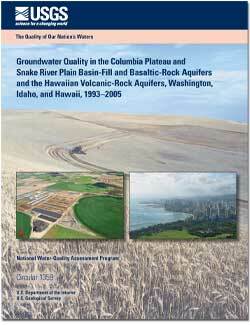 Residents of the Columbia Plateau, the Snake River Plain, and the island of Oahu depend on groundwater as their primary source of drinking water. Although the depth to the water table can be several hundred feet, the groundwater is highly vulnerable to contamination because the permeable sediments and rocks allow contaminants to move readily down to the water table. Intense agricultural and urban activities occur above the drinking-water supply and are increasing in some areas. Contaminants, such as nitrate, pesticides, and volatile organic compounds, associated with agricultural and urban activities, have adversely affected groundwater quality. Rupert, M.G., Hunt, C.D., Jr., Skinner, K.D., Frans, L.M., and Mahler, B.J., 2014, The quality of our Nation’s waters—Groundwater quality in the Columbia Plateau and Snake River Plain basin-fill and basaltic-rock aquifers and the Hawaiian volcanic-rock aquifers, Washington, Idaho, and Hawaii, 1993–2005: U.S. Geological Survey Circular 1359, 88 p., https://dx.doi.org/10.3133/cir1359.